Capture 20.9MP photos and UHD 4K video beneath the surface with this AquaTech Compac / Elite 7500 Underwater Housing and Nikon D7500 DSLR Camera Body Kit from B&H. 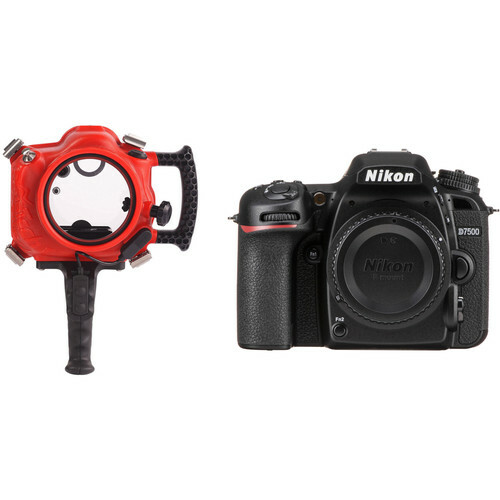 The housing is depth-rated to 33' and provides mechanical control of key camera functions and a pistol grip with shutter and autofocus buttons. The Nikon D7500 features 8-fps shooting for up to 100 frames, 51200 ISO sensitivity extendable to 1640000, 51-point autofocus, a tilting touchscreen and much more. Add a lens, the appropriate port, and a strobe or video light, and you're ready to make beautiful underwater images and video. Capture images over, under, or near the surface with your Nikon D7500 DSLR Camera in AquaTech's Compac / Elite D7500 Water Housing, which features a depth rating of 33'. Mechanical controls afford easy access to important camera functions, while an ergonomic side grip improves handling and comfort. The included Pistol Grip Trigger enables remote firing capability and focus control, allowing you to capture blur-free images with ease. Additionally, the housing accepts an optional bulkhead for the connection of external strobes. Built for durability, the enclosure's body is constructed from corrosion-resistant polyurethane and the controls are made of stainless steel, anodized aluminum, and high-strength plastic. Together, the quick-release clips with safety latches and the O-rings ensure that the Compac / Elite D7500 remains watertight to keep your camera and lens safe.